BBC runs first 4K iPlayer live broadcast ahead of World Cup | What Hi-Fi? The test ran on the iPlayer beta app on compatible TVs, showing a live stream of a rugby league match in Ultra HD and HDR. The BBC successfully broadcast live sport in 4K HDR quality on iPlayer over the weekend, raising hopes that the corporation is getting ready to launch regular 4K broadcasts. The live stream of the rugby league Challenge Cup fixture between York and Catalans was broadcast with little fanfare, but spotted by eagle-eyed rugby fans, like our own content editor, Andy Madden. Quinn Cowper, an outside broadcast engineer, confirmed he was working on the trial, and that it was being broadcast using the Hybrid Log Gamma type of HDR. A blog post from the BBC, said: "On Sunday, we streamed a full Rugby League match between the York City Knights and Catalans Dragons live in UHD and High Dynamic Range on BBC iPlayer Beta. It’s the first time we’ve streamed a live event in such high quality." The BBC said UHD broadcasts still present "significant engineering challenges", so switching to live 4K streams on a regular basis won't be easy. "We’re always looking to provide our audiences with the best possible viewing experience, and live UHD could be the next step in that journey. We’re now looking at the results from this latest experiment to help us build our understanding for how we might be able to provide live events in UHD in the future." Rumours have suggested that the BBC is working on 4K tests ahead of a full launch in time for the football World Cup, which starts on 14th June. A 4K World Cup on BBC iPlayer? Let's hope so - other countries have already confirmed their plans, after all, and with ITV not yet broadcasting on HD online, it looks down to the BBC for UK viewers. The BBC has previously said its 4K content would be broadcast on iPlayer rather than on a conventional TV channel, with Phil Layton, the BBC's head of broadcast and connected systems, saying the on-demand service was "much more flexible" compared to a channel. This was seemingly confirmed when the BBC offered Blue Planet II in 4K on iPlayer at the end of last year. 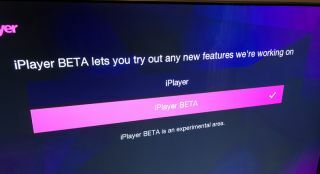 To watch that, and any future 4K video, you'll need a TV that's compatible with the iPlayer beta app. You can see a list of devices that were compatible for the Blue Planet trial on the BBC website.